The popular symbol of female empowerment, which was draped with flowers on Women's Day, now stands across from the 'Charging Bull' sculpture but is due to receive a permanent home. NEW YORK — The “Fearless Girl” statue that’s been a New York City tourist attraction since it was installed to mark International Women’s Day a year ago is staying put for now while city officials figure out where it’s going next to spread its message of female empowerment. “The Fearless Girl’s message has resonated with New Yorkers and visitors alike, and that’s something we want to remain a part of the city’s civic life,” said Natalie Grybauskas, the spokeswoman for the Democratic mayor. State Street installed the hands-on-hips bronze statue opposite the “Charging Bull” sculpture that celebrates triumphant capitalism. The installation originally was supposed to be temporary, but after the statue gained a following, city officials said it could stay for a year. The statue’s creator, Kristen Visbal, said she would prefer that the girl and the bull remain together. “I really feel that this placement of ‘Fearless Girl’ in front of ‘Raging Bull’ is a historical moment,” she said. Grybauskas did not immediately respond to a question about whether the city is considering moving both statues together. 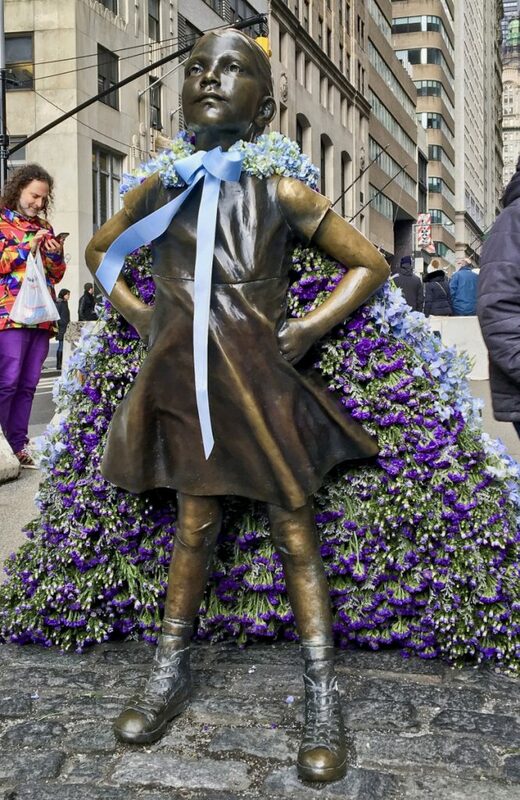 “Fearless Girl” was bedecked with a cape of blue flowers Thursday, courtesy of retailer Old Navy, for International Women’s Day. A steady stream of tourists posed for pictures with it. “It makes me feel brave, powerful,” said Maria Fernanda Zeledon, a visitor from Costa Rica. Meanwhile Thursday, a replica of “Fearless Girl” was installed in front of Norway’s legislative building in Oslo. “I’m really excited that we have a piece on the other side of the world that’s sending this message of diversity,” Visbal said.